John Deere Gators are powerful vehicles that master every task. No matter what kind of landscape, the Gator can handle it. Sure they are small, but size doesn't matter, because they are little Giants. Both outdoor enthusiasts and professionals are invited to enjoy a unique test drive experience this spring with the full range of John Deere Gator utility vehicles. Around 50 John Deere dealers across the UK and Ireland will be hosting a series of Gator Experience Days throughout the month of April, with some additional dates in March and May. Potential customers will be invited to a one-day event where they will not only be able to put the latest Gator models to the test in challenging off-road conditions, but also discover a range of John Deere solutions including parts availability, financing and PowerGard warranty extensions. A special 0% finance offer will be available for customers who buy a Gator within 14 days of attending their local event. 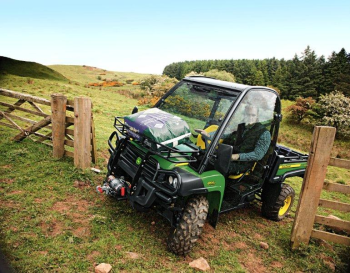 The Gator Experience Days are aimed at all potential utility vehicle customers such as farmers and landowners, gamekeepers, landscapers, contractors, local authorities, commercial amenity and property managers, turf and groundscare professionals ? the list is endless. A dedicated website where customers can register - www.JohnDeere.com/testdrivers - has been specially created, and contains information about dates and locations for the various events that will be taking place. John Deere offers the broadest range of utility vehicles in the industry, with 11 models to choose from altogether, from the compact CX Gator up to the new XUV 855D Gator with power steering. The XUV cross-over models feature true on-demand four-wheel drive and independent suspension on all four wheels for excellent performance and driving comfort, both on and off road. Gator utility vehicles are ideal for a wide range of transporting, loading, hauling and general materials handling duties, and are equally at home in heavy mud or on delicate sports turf areas. They feature a low centre of gravity for extra safety and stability, as well as a good power to weight ratio. Options include a range of different tyres, full cabs, road homologation kits and many other accessories. New vehicles available for test drive include the 854cc XUV 855D Gator, the fastest and most powerful diesel utility vehicle in the John Deere line-up, with a top speed of 52kph (32mph), as well as the recently introduced mid-duty XUV 550 and XUV 550 S4 cross-over vehicles. These two petrol models offer customers the choice of a two- or four-passenger vehicle, and are the perfect fit for both work and recreation. The rest of the John Deere Gator range includes electric, petrol and diesel models with two- and four-wheel drive, designed to provide the right machine for any application, from estates, farms, golf courses, parks and sports grounds to airports, construction sites, shows & events, hotels and zoos - Gators have even worked in the Antarctic! John Deere's comprehensive Gator range is supported by a national network of specialist servicing dealers offering 24/7 parts availability, low-cost or interest-free finance from John Deere Financial, and new John Deere PowerGard. This is a straightforward solution to equipment servicing and repair work that is designed to help customers budget for the total cost of ownership, and keep their Gator running trouble-free for the life of the vehicle.